Of all of the Hawaiian Islands, Kauai is perhaps the most fitting place for the Kōloa Rum Company to call home. Captain James Cook (commanding the HMS Resolution) and the HMS Discovery first landed on the Hawaiian Islands at Waimea, Kauai in 1778; in the holds of both ships were barrels of rum. Hawaii’s first sugar plantation was founded in Kōloa, Kauai in 1835, and small batch rum was said to be produced from the very first harvest, which took place in 1837. It’s from this Kauai town that Kōloa Rum gets its name. Kōloa Rum is distilled and bottled in nearby Kalaheo, where Hawaiian Fruit Specialties company, maker of Hawaiian Kukui products, has been located since 1931. Several years ago, Kōloa Rum bought Hawaiian Fruit Specialties and streamlined the company’s offerings to its most popular tropical jelly and syrup products; added rum cocktail mixers; and renovated the facility to set up the primary Kōloa Rum distillery. Kōloa Rum received Kauai’s first and only license to distill alcohol in April 2009. A second license was obtained in September for a demonstration still at the Kōloa Rum Tasting Room, located at the historic Kilohana Plantation. Kōloa Rum currently produces three rums: Kauai White, Kauai Gold and Kauai Dark. Not even a year after launching its distilling operations, Kōloa Rum has already won several awards and started to expand its distribution eastward, from across the State of Hawaii to the mainland, making landfall first in California. 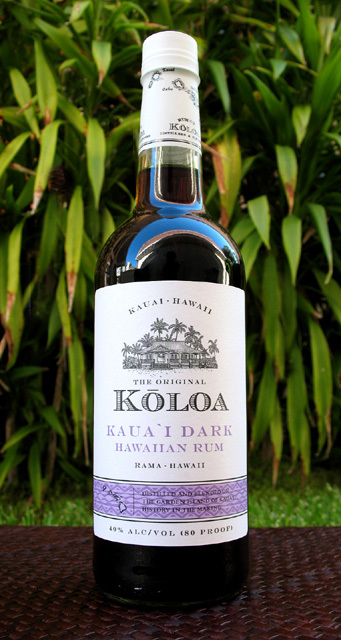 The Booze Fairy, feeling the Aloha Spirit, recently dropped off a bottle of the Kōloa Kauai Dark Rum for review. Kōloa distills its rum from sugarcane and rainwater, ingredients that are the epitome of “locally-sourced.” The raw crystal sugar is from Gay & Robinson, Kauai’s last operating plantation before it closed in October 2009, after 117 years in business. In the meantime, Kōloa is collaborating with a local landowner to grow its own sugarcane. Kōloa taps underground aquifers that store rainwater from Mt. Wai’ale’ale and nearby peaks and rainforests. Kōloa’s 1210-gallon, hand-hammered copper pot still incorporates a column distillation process. The vintage still was manufactured in New England shortly after World War II, and was last used to make bourbon and other distilled spirits in Kentucky. Despite its youth, the Kauai Dark Rum is distinguished by its sweet and smooth flavor profile, the result of its small batch distilling process and use of pure, local ingredients. It’s an artisanal rum that will continue to make waves as it crosses the Pacific. Kōloa Rum is currently available in Hawaii and California. In Southern California, it’s available at Hi-Time Wine Cellars. Color – Deep maroon, mahogany. Nose – Upfront molasses and vanilla, citrus notes. Palate – Warm mouthfeel with molasses, caramel and orange peel. Finish – Long and smooth, with a touch of spice. 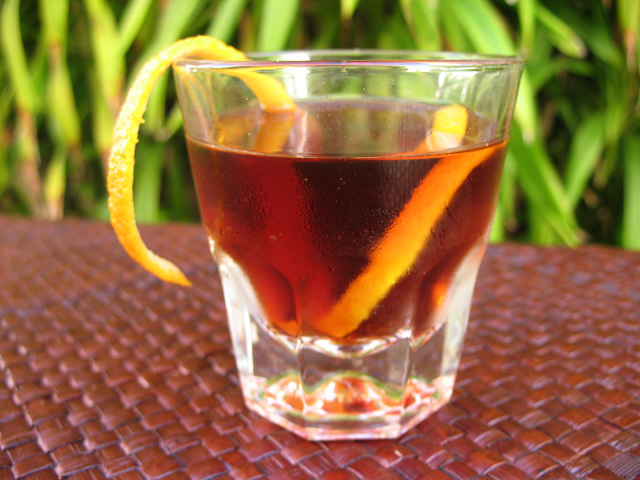 Though it’s perhaps best enjoyed neat, Kōloa Kauai Dark Rum also does well as a base spirit in cocktails, as in the following recipes. First is the Smuggler’s Notch, a Sazerac variation by Eric Alperin (The Varnish), from the excellent Left Coast Libations book. Then it’s The Rumpress, a recipe suggested by Kōloa and created by Nick Bill of Tao Restaurant in New York. Muddle the sugar cube and bitters in a mixing glass. Add the dark rum and ice. Rinse a whiskey glass with the absinthe or Herbsaint. Stir and strain the cocktail into the prepared whiskey glass. Spray the top of the cocktail and garnish with the orange twist. Combine ingredients in a shaker with ice.